21 January 2012. This winter is the winter of the owls! Hundreds of Snowy Owls left their far-northern haunts in search of food in the northern tier states of the Lower 48. While I was trying to make my mind up as to when I was headed south to photograph Snowy Owls, an irruption of our own kicked off here in the Anchorage area. All of the sudden Great Gray Owls were appearing everywhere! There was one day I located seven Great Gray Owls! Not only did I locate seven Great Grays that day, I also found a Northern Saw-whet, a Short-eared Owl, a Boreal Owl, and a Northern Hawk-owl that same day! It was a winter to remember. If you would like to see some truly great flight shots of Great Gray Owls visit the sites of friends Ryan Miller, http://www.explorealaskaphoto.com, and Tom Rohrick, http://www.photographingalaska.com. They were in the right place at the right time! Oh, I never made it down to the lower 48 to photograph Snowy Owls! 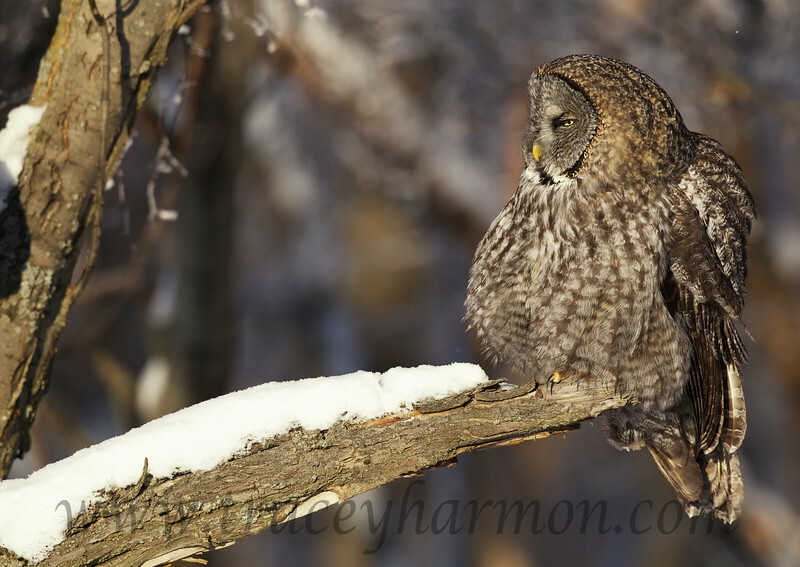 If you would like to see more of my Great Gray Owls photos go to "Galleries", then "Birds", and finally "Owls". You'll find more photos there. By the way, I add photos of something wild to this site, and others, almost nightly. Please visit this site, or my Facebook page https://www.facebook.com/traceyharmonphotography, or my National Geographic page http://yourshot.nationalgeographic.com/profile/1628600/ regularly. 25 December 2011. Merry Christmas! I should be ashamed of myself as I am out photographing Dall Sheep rather than laying low at home with my beautiful wife Kim...oh wait, she's in San Diego! Hanging with our daughter, Kassidy Cervantes, and our son-in-law, Alejandro Cervantes. Yes, that's "the" Alejandro Cervantes. You can see his work at http://www.cervantesguitars.com. I am quite grateful that each of these three are very understanding of my habits. How understanding? Last Christmas (2010) I was photographing Brown Pelicans in La Jolla, California while they hung out at the house! My health and my family are my gifts, and I am quite thankful. Oh yeah, Dall Sheep. I photographed this magnificent ram along the Turnagain Arm just outside Anchorage, Alaska. 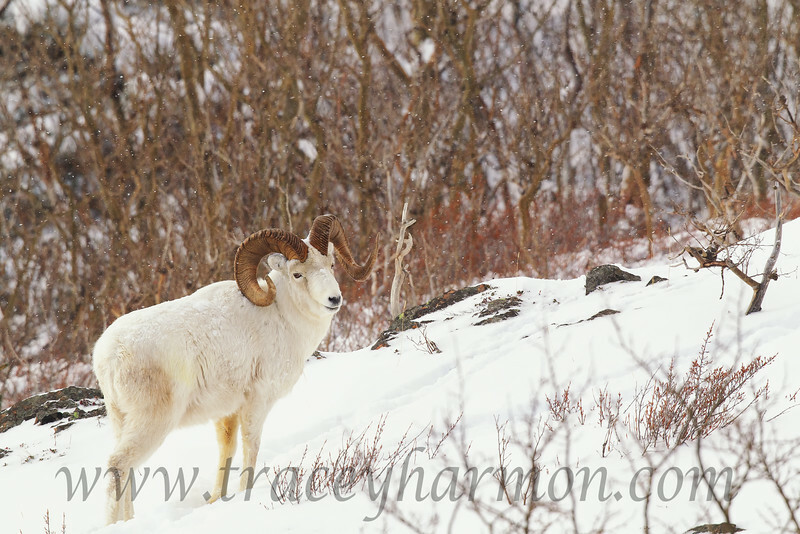 If you would like to see more of my Dall Sheep photos go to "Galleries", then "Mammals", and finally "Sheep". You'll find more photos there. By the way, I add photos of something wild to this site, and others, almost nightly. Please visit this site, or my Facebook page https://www.facebook.com/traceyharmonphotography, or my National Geographic page http://yourshot.nationalgeographic.com/profile/1628600/ regularly.